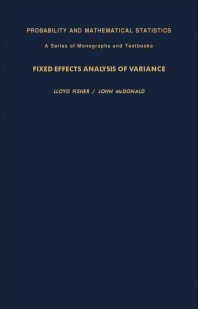 Fixed Effects Analysis of Variance covers the mathematical theory of the fixed effects analysis of variance. The book discusses the theoretical ideas and some applications of the analysis of variance. The text then describes topics such as the t-test; two-sample t-test; the k-sample comparison of means (one-way analysis of variance); the balanced two-way factorial design without interaction; estimation and factorial designs; and the Latin square. Confidence sets, simultaneous confidence intervals, and multiple comparisons; orthogonal and nonorthologonal designs; and multiple regression analysis and related matters are also encompassed. Mathematicians, statisticians, and students taking related courses will find the book useful.